I had more fun transforming their existing recipes into healthier, spiralized versions than I did creating my own. 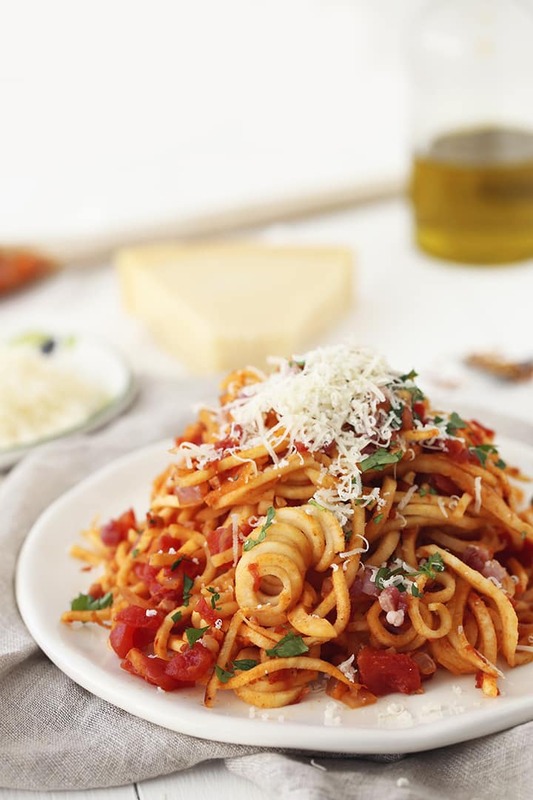 It shows the true power of the spiralizer! Using the spiralizer (well, the Inspiralizer to be exact,) I simply replaced regular spaghetti with vegetable noodles. Of course, this drastically changed the nutritional value of those recipes – for the better! This recipe uses parsnip noodles, which are the perfect vehicle for soaking up the sweet, savory flavors of the guanciale (or pancetta, if you use that instead!) The parsnips have an inherent nuttiness which also complement the saltiness of the tomatoes and cured meat. 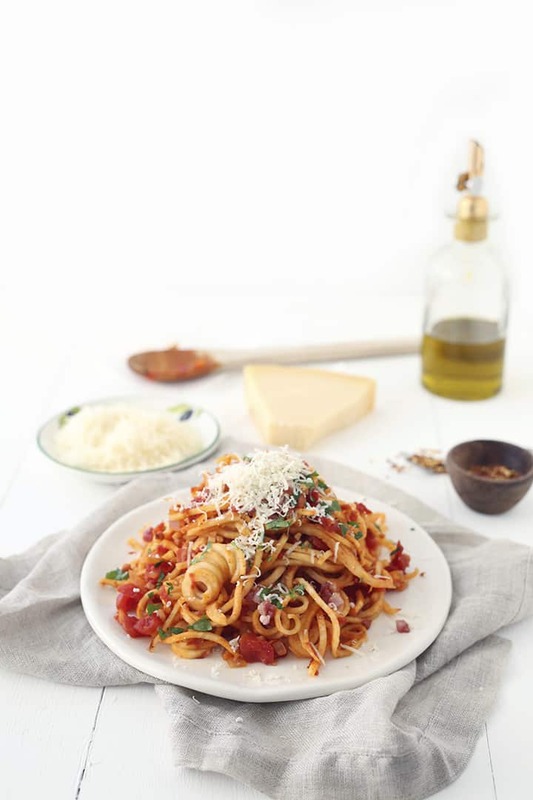 Pretty much, this dish has my favorites: tomatoes, pecorino romano cheese, cured Italian meat and of course, something spiralized! There’s more I can’t wait to share with you all. In the meantime, mangiamo! You can also find this recipe on their website by clicking here. 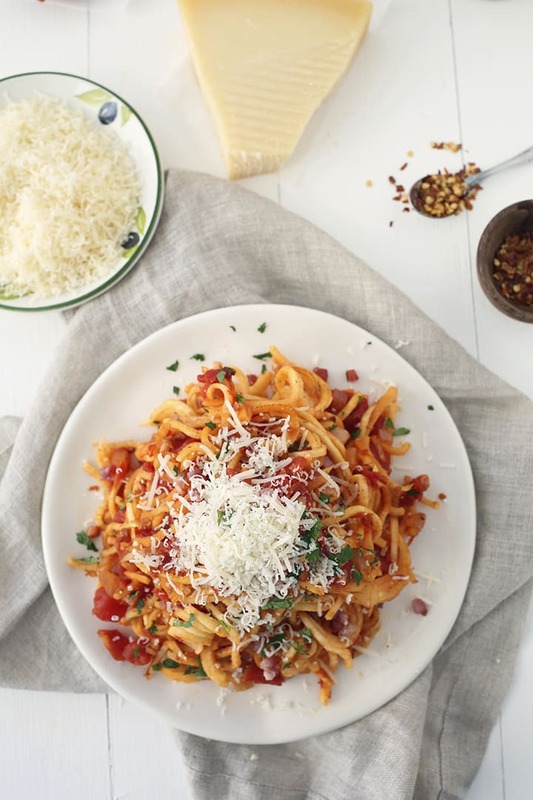 Have you ever made all’amatriciana before? What do you do differently? Place a large pot over medium heat and add in the olive oil. Add in the guanciale (or pancetta) and cook until brown and crispy, about 5-7 minutes. Reserve 1 tablespoon of the meat – set aside in a small bowl. Add in the onions and red pepper flakes and cook for 3-5 minutes or until onions are translucent. Add in the tomatoes and raise the heat to medium-high and bring to a boil. Season with salt, reduce to a simmer at low heat and let cook for 30 minutes. Meanwhile, peel and spiralize the parsnips, using Blade C. After the sauce has cooked for 30 minutes, add in the parsnip noodles, toss to combine thoroughly and let cook for 10 minutes or until parsnips are al dente. Divide the pasta mixture into bowls and garnish with cheese and the reserved meat. Can you use rutabega in place of the parsnip in the Parsnip Spaghetti All'Amatriciana? i find parsnips aren't very uniform they're really big at the top and skinny further down the root. A lot more skinny from the top . Are they still usable? You can use your veggie peeler for the parts near the tip so there is no waste - or pop the tips in the freezer for when you make bone broth or chicken soup!!! Big fan of the spiralizer, bought your cookbook, and have been incorporating into my own recipes. A couple of observations, my appliance has the suction feet instead of a lever that keeps your spiralizer in place. Are there different models? We don't eat pork and I notice that a lot of recipes call for it. I've been using hamburg or ground turkey. Any other suggestions? Also, wherever possible, I try to lower the sodium and fat content. Always a challenge, but achievable. Thanks so much for introduction. Met a daikon radish for the first time. Fun!! Happy Birthday! Never like parsnips to eat - good for soup but you have turned me into a parsnip fan with your recipe for spiralizing it. I put in in my bone broth, in salad, fry (makes great curly fries along with spiralized yams). Thanks for your great creativity in using vegetables in different and unique ways. I know there are other books on spiralizing out there, but your originality SHINES thru them all. Congratulations on a job well-done! 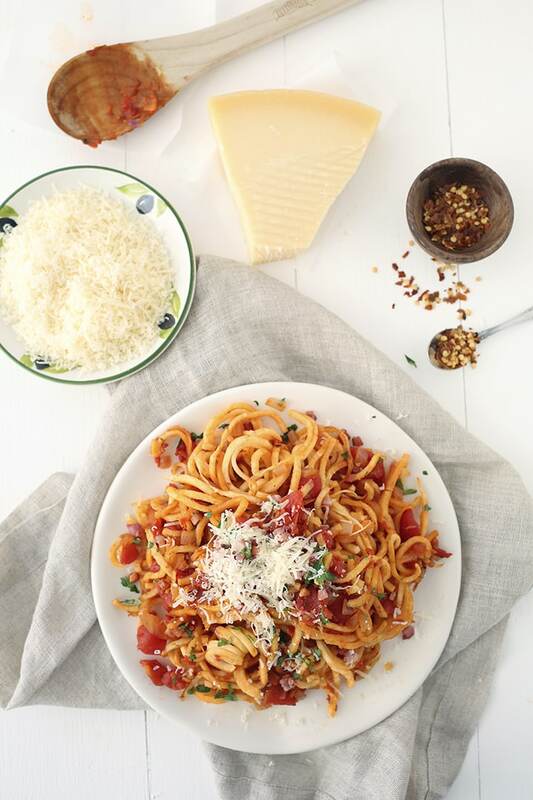 How has your life changed since you discovered the spiralizer? I can finally eat "pasta" and "noodles" again- it's made being creative in the kitchen a whole new experience! This was terrific! Made it for family who had never had a spiralized dinner. All really enjoyed it. It was fun to show off the spiralizer! Thanks! Sounds awesome! Can't wait to try. Wow! I'm very late the Spiralizer buzz..... This was my first attempt. Amazing flavour and has stopped my husband's jokes about 'needing' a Spiralizer full stop. We are both hooked! Just wanted to say I made this last night for friends and finished off the leftovers this eve. Fantastic. One of my favourites yet - thanks so much for doing what you do. This is so fantastic to hear! We're so glad you enjoyed this recipe. Parsnip noodles so far have been the best with tomato sauce. I tried a quick version of this recipes today. Some quick boiled parsnip noodles with a heated up tomato sauce and it was delish. So identical to the real thing. Nice surprise since it was my first time trying parsnips this way. ...maybe even ever? Going to remake this for my next Sunday pasta night dinner and see what the hubby says! I have frozen tomato meat sauce in the freezer I made about a month ago for spinach pasta. I'm thinking these parsnip noodles might be the perfect thing to eat with it.